For the 33+ million Americans who suffer from overactive bladder symptoms, the idea of traveling, road trips, and family vacations can seem impossible. The truth is, with some careful planning and a bit of preparation, it’s more than possible! There is no reason to let OAB and its symptoms ruin your summer fun. Take back your life–use these tips to travel “accident-free” this summer. If you’re seeing a doctor for your overactive bladder symptoms, you’ve likely discussed certain lifestyle changes, exercises, and habits that will help you manage your OAB symptoms. Though these treatments and changes can be extremely effective, you’re not going to see a change overnight. Practice time voiding. Find a bathroom break frequency that works for you and hold yourself to it while traveling. If you train yourself to go every two hours then you’ll know to plan breaks in two-hour increments throughout your travels. Strengthen your bladder muscles with Kegel exercises. Your doctor can offer guidance when it comes to specific exercises. 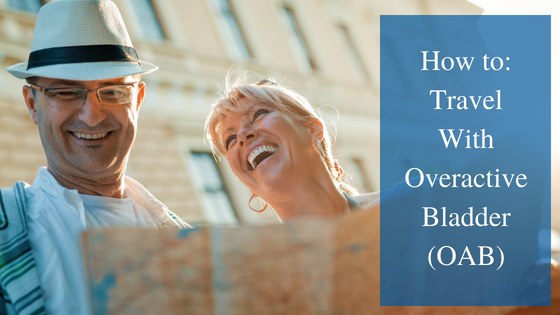 Take control of OAB with these additional tips! While the goal usually is to pack only what you need and nothing more, we’re giving you the go-ahead to over pack. Pack extras of everything! Although you hope they won’t, some accidents are going to happen and the only thing you can do is be prepared for them. It is a good idea to pack an “emergency kit”, and keep it close by (remember this especially in cases where your luggage might not always be accessible). Pack clean undergarments, pants, absorbent pads, and barrier cream (to keep your skin from getting irritated by the wetness)–really anything you’ll need in the case of an emergency. While you’re at it, include sanitary wipes, hand sanitizer, and tissue paper because we all know rest stop bathrooms aren’t always in the best conditions and hardly ever fully stocked. Guarantee your accommodations will cater to your needs. Inquire about whether your hotel offers a laundry machine. This will be a huge help, especially if your stay is more than a few days. Request an extra set of bed sheets for your room. Locate rest stops along your route. Download the “Sit or Squat” app for rest stop locations and ratings! Arrange to have a seat with easy access to a bathroom (rear or front row aisle seats are usually your best bet). *Note: Remember that medications take time to get into your system and kick in. If you wait until you need relief, it will be too late. Plan ahead! Schedule an appointment with one of our Urology Specialists at any of our Charlotte area locations before you plan to travel. We can help you get your OAB symptoms under control and provide more tips to help you enjoy yourself while traveling this summer. We know you’ve probably spent too much time stressing about OAB, leave that stress at home this summer.